A fast-moving storm system triggered multiple tornadoes that have swept through the US Midwest killing six people and injuring dozens. 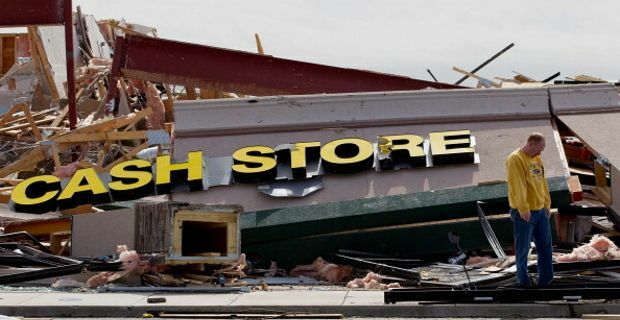 Tornadoes flattened large parts of Washington, Illinois as it tore across the Midwest destroying buildings and overturning vehicles also in the states of Indiana and Kentucky. Weather forecast services had warned 10 states were at risk last Sunday, also advising people not to wait until they saw the weather change. The fast-moving storms, with winds of up to 111km/h (68mph), were unusually destructive for this time of year. They levelled houses and tossed cars around, uprooted a number of trees which in turn damaged power lines. It is feared that several people may have been injured, with some still trapped inside buildings. Illinois was the hardest hit state. All the six reported fatalities were in Illinois, where the tornado left a scene of devastations similar to a awar zone. Illinois state police say they are worried several people may be still trapped inside their homes. Eyewitnesses described how large parts of the town of Washington, Illinois, had been flattened by the tornadoes, which demolished entire neighbourhoods. Washington is a 15.00 strong town, 145 miles southwest of Chicago, and it was hit hard as tornadoes tore across the Midwest. "The devastation is just unbelievable," said Mayor Gary Manier. Over 80 tornado reports were received, along with 358 reports of damaging winds and 40 reports of large hail stones. Tens of thousands of people in several states lost power for a short amount of time, while air traffic at Chicago's two major airports was temporarily halted for security reasons. You could have someone’s eye out with that!